Galerie Louise Leiris, Paris (14339). J. Cassou and Jean Leymarie, Fernand Léger, Dessins et Gouaches, Paris 1978, no. 202 (illustrated in colour p. 142). Hamburg, Kunstverein, Fernand Léger: Gouachen, Aquarelle, Zeichnungen, 1983, no. 88, p. 117 (illustrated in colour). This exhibition later travelled to Münster, Westfälisches Landesmuseum, Tübingen, Kunsthalle, Madrid, Fundacion Juan March. London, Whitechapel Art Gallery, Fernand Léger: The Later Years, November 1987-February 1988, no. 78, pl. 30 (illustrated in colour). This exhibition later travelled to Stuttgart, Staatsgalerie, March-May 1988. Both Le perroquet and the following lot, Etude de femme, appear to relate directly to the highly important oil painting Composition aux deux perroquets, 1935-1939, which is now housed in the Musée National d'Art Moderne, Paris. The oil painting, which is Léger's largest canvas, was of great importance to the artist. 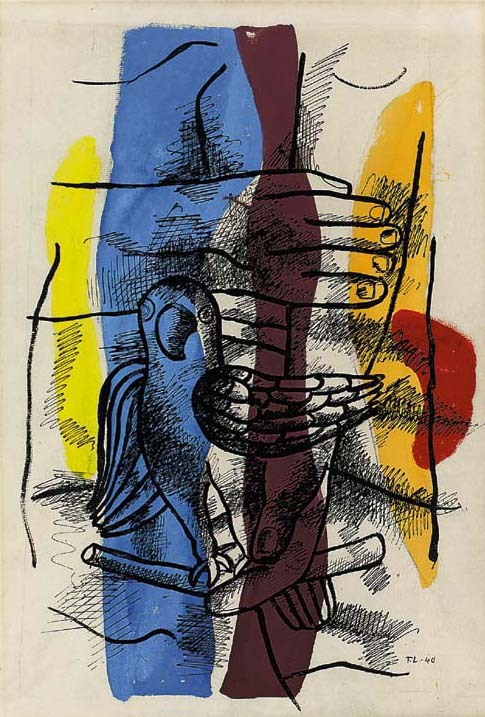 While in New York in 1942 he wrote: "The present phase of my creative activity (concerning the use of figures in space) began in 1936-7 with the painting of the Composition aux deux perroquets. Three years' work preceeded its completion." It would appear that Le perroquet is a gouache executed after the painting, singling out the parrot as the main protagonist of the work. Etude de femme, on the other hand, would appear to be a working sketch for the painting.